In this type of connection, the primary connected in delta fashion while the secondary current is connected in star fashion as shown in the Fig.1. 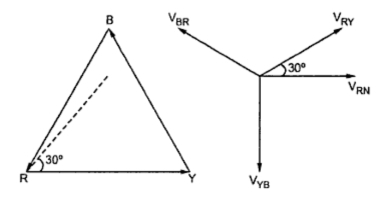 The voltage on primary and secondary side can be represented on the phasor diagram as shown in the Fig. 2. The another way of representing the same type of connection is shown in the Fig. 3. The main use of this connection is to step up the voltage i.e. at the begining of high tension transmission system. It can be noted that there is a phase shift of 30° between primary line voltage and secondary line voltage as leading. Key point : As secondary side is star connected, use of three phase, four wire system is possible. 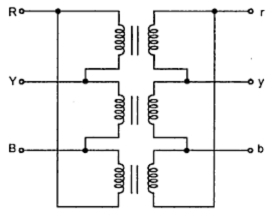 Thus single phase and three phase loads can be supplied with this type of connection. Let VL1 = Line voltage on primary side. VL2 = Line voltage on secondary side. Vph1 = Phase voltage on primary side. Vph2 = Phase voltage on secondary side. The advantages and disadvantages with this type of connection are given below. On primary side due to delta connection winding cross-section required is less. On secondary side, neutral is available, due to which it can be used for 3-phase, 4 wire supply system. There is no distortion due to third harmonic componenets. The windings connected on star makes it economical due to saving in cost of insulation. Large unbalanced loads can be handled without any difficulty. Due to phase shift between primary and secondary voltages, the limitation of Star-Delta connection continues for this type of connection as well.